Sweet or sour? While you might think we’re talking about candy, this week’s Word Wednesday is actually about crude oil. Join us as we explore the sweet and sour properties of crude oil as well as chemical dispersants that were used in the clean-up of the Deepwater Horizon oil spill. Last week we discussed the importance of the oil and gas industry to the Northern Gulf of Mexico. While this industry provides thousands of jobs and billions in job wages, the oil spill brought to light the risks to the environment and public health and the need to improve our responses to oil spills. While large events like the Deepwater Horizon spill (DWH) are thankfully uncommon, one of the controversies that emerged concerned the use of chemical dispersants, especially at the depth of the well. Vessel traveling though floating surface oil from the Deepwater Horizon Oil Spill on May 6, 2010. Photo credit:Reuters/Daniel Beltra. Natural crude oil comes in many varieties and can be sweet, sour, heavy or light depending on its properties and location. The Deepwater Horizon oil rig leaked approximately 4.9 million barrels (200 million gallons) of Louisiana (light) sweet crude oil into the Gulf of Mexico (GoM). Crude oil is a mixture of chemical compounds of varying composition, molecular weight and importantly, toxicity. Many of these compounds are referred to as hydrocarbons as they contain the elements carbon and hydrogen. Crude oil is characterized by its density and sulfur content. Low density oil is considered light while high density is considered heavy. A low sulfur content is considered sweet while high sulfur content is considered sour. In terms of market value, crude oil that is light and sweet is priced higher as it can be more easily and cheaply refined. In contrast, the oil spilled in the Exxon Valdez event in 1989 was Alaska North Slope crude, a heavy, sour oil. While some of the spilled oil was collected at the site of the wellhead, approximately 4.1 million barrels (172 million gallons) was released into the GoM. The oil that rose to the surface formed a sheen or oil slick, some was collected by skimming and some was burned. 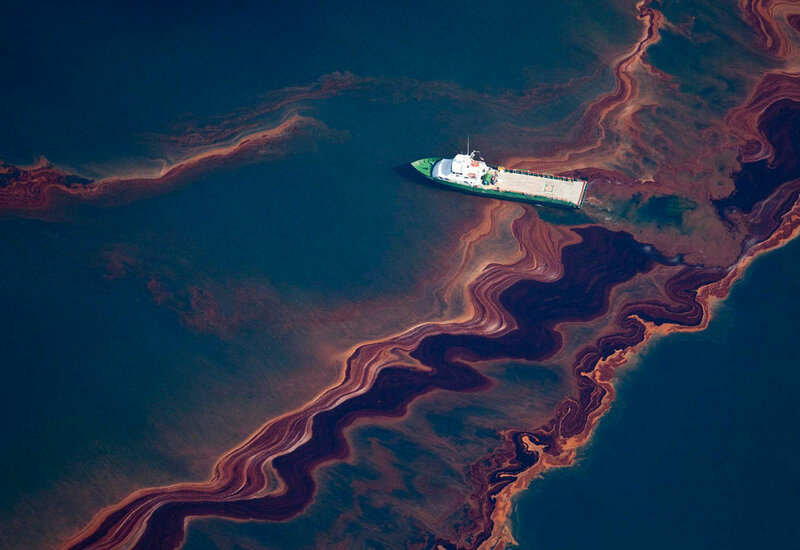 However, to reduce the amount and impact of the oil, chemical dispersants were also used. Chemical dispersants are composed of solvents and surfactants (lipid compounds) that break up the oil into smaller droplets. If oil is in smaller droplets, the rate at which it breaks down or biodegrades is increased. Thus, dispersant use is a common approach to cleaning up oil spills. The dispersant used in the DWH event was Corexit. Close to two million gallons of Corexit were used: approximately one million gallons of Corexit were sprayed at the surface on over 300 square miles of oiled surface waters, the other one million gallons were injected at the wellhead at a depth of 5,000 ft (approx. 1 mile). The application of Corext at depth was unique to the DWH event. What appeared to have happened is that the smaller droplets created by the application of Corexit at depth rose through the water column, not to the surface, but to the depth at which they were neutrally buoyant. This created an underwater ‘plume’ of oil that was observed at depths around 3600 ft (1000m). The fate of oil in this plume is still being studied, but data indicates that some of it subsequently sank and has been deposited on the seafloor. Aerial application of dispersants work by breaking down the oil into smaller droplets that can be consumed and degraded by bacteria. Those bacteria are then consumed by protozoans and nematodes. Photo credit: Clark J. Dispersant Basics: Mechanism, Chemistry, and Physics of Dispersants in Oil Spill Response. Presentation to NRC Committee on Understanding Oil Spill Dispersants: Efficacy and Effects, 15 March 2004. Chemical dispersants are toxic and their use is carefully regulated and monitored by the National Contingency Plan (NCP). Seafood from the Gulf of Mexico was rigorously tested during and after the oil spill for toxicity from the dispersants and for oil contamination in the form of polycyclic aromatic hydrocarbons (PAHs). In fact, federal and state scientists tested more than 22,000 seafood samples during the oil spill and did not find any samples where chemical levels such that the seafood was considered unsafe to eat. Organizations including the Environmental Protection Agency (EPA) measured the air quality for dispersant chemicals both onshore and offshore monitoring for levels likely to cause any human health effects. Restrictions on areas where dispersants were applied resulted in minimal or no exposure of the public to these chemicals. In fact, the EPA and U.S. Coast Guard concluded that the dispersants had in fact been an important tool for reducing the oil spill’s impact and that it had prevented damage to coastal habitats. 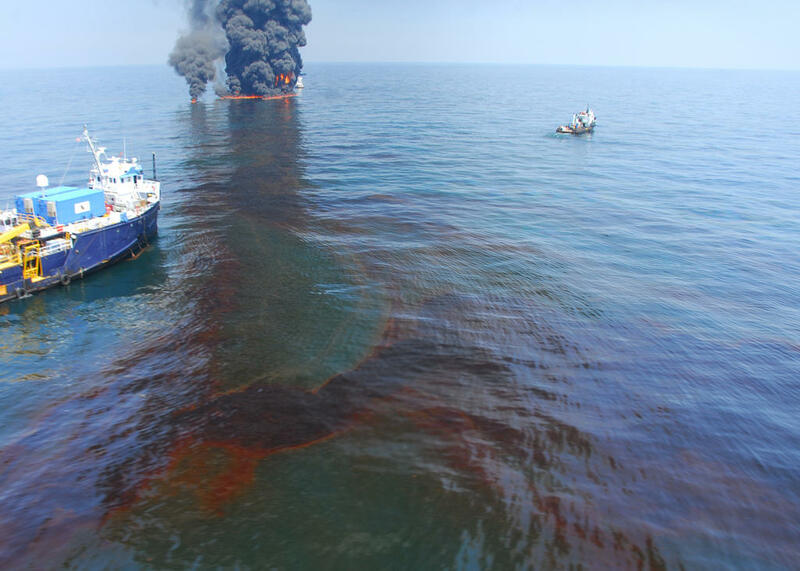 To learn more about dispersants, their use during the Deepwater Horizon Oil Spill, and response of aquatic life to oil and dispersants, visit the Oil Spill Science page on the Gulf SeaGrant’s website by clicking here.